Environmental and public health informatics is an emerging field that focuses on standardized data collection, sharing, and use. Data is transformed into information that is then used to better inform and develop programs. By moving towards the wider adoption and use of informatics systems, we can expect data-informed decision making that will improve population health. Local, state, and federal agencies collect environmental health data that may not always be routinely analyzed or used to inform public health initiatives, especially at smaller local-level agencies. Environmental health professionals collect data through inspections, complaint investigations, and community interactions. The incorporation of this data with other public health data has the potential to inform programs in ways that have not yet existed. Imagine a physician taking a patient’s home environment into account when making a diagnosis. Or, imagine using an app to easily assess the safety of an aquatic facility, restaurant, or body art studio. NEHA’s Informatics Resources serve to support environmental health informatics programs and data-use activities. These resources showcase data collection, sharing, and use stories and serve to support the implementation of these activities within your own program. Resources include online education, a repository of free and low-cost tools, case studies, and more. Environmental and public health tracking and informatics is an essential piece of local, state, tribal and federal agencies as it relates to the status of the public and environmental health in this country. Data is the holy grail of information for local health departments and federal agencies alike for determining what projects to take on next and how to better the community. Some would even suggest that data has been responsible for diverting illness and potentially saving lives. Well, environmental health does save lives, money and protect the future, right? So why wouldn't data? NEHA and the CDC have partnered to help engage local health departments to start sharing data to better inform the community while contributing to a nation-wide network. Environmental Health tracking is about engagement and access and NEHA is constantly working with EH professionals to use data effectively, and share data efficiently. 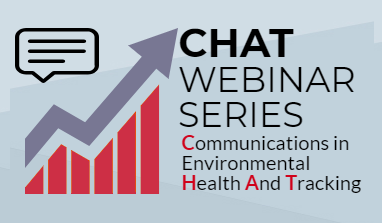 In partnership with CDC’s NCEH, NEHA will be hosting the Communication in Environmental Health and Tracking (CHAT) Webinar Series. This five-part webinar series will explore different communication and outreach strategies to facilitate a tracking program's engagement with traditional and non-traditional partners, impact policy and work effectively across divisions. NEHA partnered with CDC Tracking on the GREAT Programs webinar and resources focused on utilizing student interns in program activities. The webinar highlighted two CDC grantee tracking internship programs at the New York State Department of Health and the Wisonsin Department of Health Services. The speakers discussed their experiences developing and supervising internship programs, one of which has developed into a funded program with promotional materials. Visit the Building Programs Through Student Internships page, to access the Student Internship Sample Workplan and the Student Internship FAQ.